Sales at Marks and Spencer's clothing and home division fell at a slower rate than before in the first quarter, the retailer has said. M&S said like-for-like sales, which strip out the impact of new store space, fell by 1.2% at the division in the three months to 1 July. This compares with a 5.9% fall in the final quarter of its financial year. Group like-for-like sales fell by 0.5% and chief executive Steve Rowe said trading was in line with expectations. He said that during the three months, the retailer had grown full price sales for clothing and home, adding that M&S had reduced discounting and did not have to hold a clearance sale during the period. However, like-for-like food sales dipped by 0.1% - which was worse than expected - and without Easter falling in April, comparable revenue across the UK business would have declined further. M&S said that the timing of Easter this year lifted food sales by 0.7% and clothing and home trade by 0.6% in the quarter. 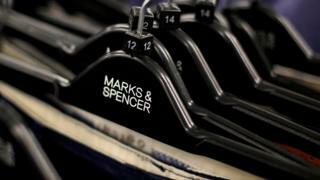 Laith Khalaf, senior analyst at Hargreaves Lansdown, said that despite the slowdown in the sales decline at M&S's clothing division, there was still "not much to cheer about". "However, the fact that things are on an improving trend at least vindicates the decision to reduce promotional pricing, which should improve margins." Mr Khalaf said that while M&S's food sales were being helped by its store expansion programme, "the continued fall in like-for-like sales at existing stores is a disappointment". "Overall conditions for high street retailers remain pretty grim, with consumer purses under pressure and competition coming from all angles. M&S is swimming quite hard against this tide, so it deserves some credit for treading water," he said. In total, sales across the whole of Marks and Spencer, including its international operation, increased by 2.7% in the quarter to £2.5bn. The retailer released the figures ahead of its annual general meeting on Tuesday where Robert Swannell will give his final address to shareholders as chairman. Mr Swannell has served in the role since 2011. He will be succeeded by Archie Norman on 1 September.